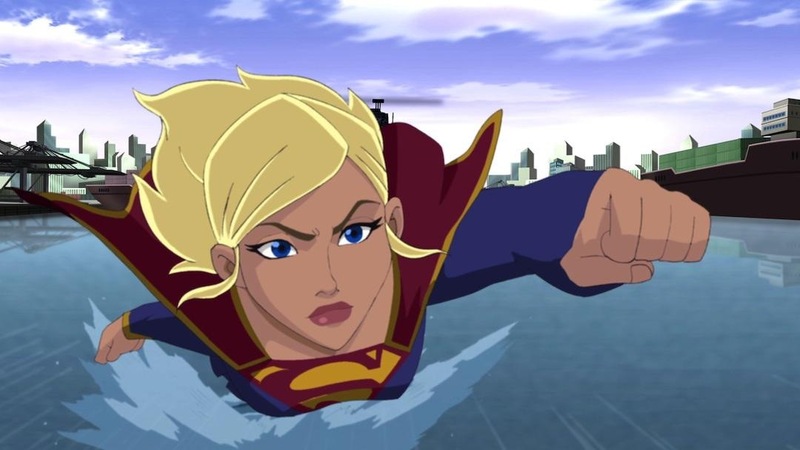 Supergirl stars in a leading role in this original animated movie which picks up a few months after the events of Superman/Batman: Apocalypse . The movie is an adaptation of the “Brainiac” storyline originally published in Action Comics #866-870 (2008). When an advanced drone sent by Brainiac appears on Earth, Kara must once again face the menace which stole Kandor and traumatized an entire planet. Supergirl must protect Earth while Superman sets out to find and stop Brainiac. He discovers that the abducted Kryptonians are still alive and living in a bottled city on Brainiac’s ship. The movie deviates from the source in a few plot points to tell a stronger self-contained story that strengthens Kara’s role and focuses more on the Lois and Clark romance (which was at a earlier stage than the comics). The PG-13 rating puts the movie out of reach for younger viewers, but the original story is graphically violent and could be upsetting. The movie delivers on the intense emotional scenes showcased in the trailer. Some of the anatomy could be better — Kara’s wasp-waist, Clark’s angular features and overly bulked physique render the characters less attractive than perhaps the animators realize. I also preferred Lois’ long-haired look from the comic to the short angled style seen here. There are some lovely character moments between Kara & Kal and Kara & Lois. Supergirl plays a big role in this story, with a strong emotional arc and lots of great action scenes. Starring Molly Quinn as Supergirl, Matt Bomer as Superman and Stana Katic as Lois Lane.